Brendan R. Nelson - Mowbray & Son, Inc.
Brendan joined the engineering team at Mowbray & Son Inc full-time in January 2019. He graduated from Minot High School in 2013. In December 2018, Brendan graduated from NDSU with a bachelor’s degree in Mechanical Engineering. While attending NDSU, he was part of the 3M Disruptive Design Challenge. He’s team won the top prize in the April 2018 competition held in St. Paul, MN. Brendan’s hobbies include playing guitar, playing video games and wood working. Brendan participated in Mowbray’s summer intern program from May 2016 to August 2018. 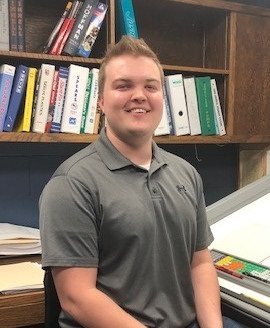 Brendan will be working as an estimator for the Sheet Metal/HVAC division and also be working with the Revit MEP software for both the plumbing and sheet metal divisions.